Do you want to buy a nice Absinthe Poster? We sell original Absinthe posters in our store. We have everything you need to decorate your room. The posters are printed on thick paper and reasonably priced, so that you can also change the designs once in a while. Check them out, we have nice Absinthe posters for sale in our shop. Where can I buy an Absinthe Poster? 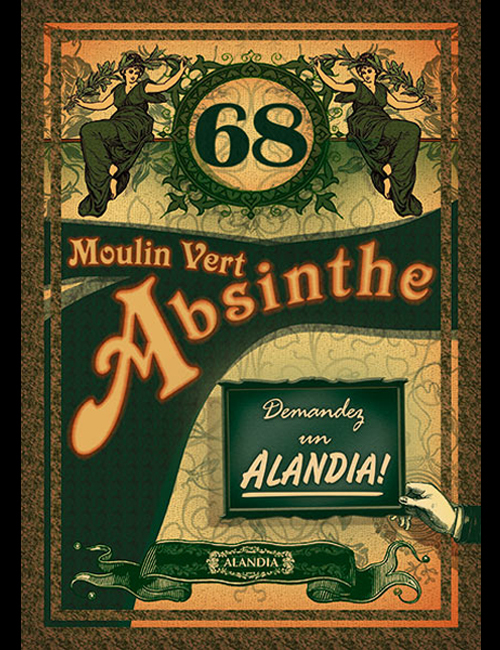 You can buy an Absinthe poster online at ALANDIA. We sell some vintage designs and some contemporary designs of Absinthe brands like Moulin Vert, Strong68 or La Bleue. You see the Moulin Vert design at the left side. Maybe you are wondering why there are as well so many vintage designs available. Well, Absinthe was THE drink of the 19th century. During this time photography was still very expensive as it was just invented. Therefore all the ads for Absinthe were painted or printed. This created a large assortment of unique designs. They can all be used for posters and some can be found in our poster shop. An Absinthe poster is something very authentic and special, as it represents the style of the Belle Epoque. You might know artists like van Gogh, Toulouse Lautrec or Manet. They all have painted beautiful paintings with Absinthe as the main theme. For example the Absinthe drinker by van Gogh or the famous Moulin Rouge pictures by Toulouse Lautrec. The posters are printed in good quality and are sold at very good prices. Therefore you can buy different designs and change them once in a while. We will ship worldwide, to the US and Europe the shipping time is approx. 7 days. Our favorite is the Absinthe-prohibition poster with the anti alcohol monk. It was an ironic poster of the past, blaming society for stigmatizing the Green Fairy. But also different Absinthe labels are available. Did you know: Toulouse Lautrec, van Gogh or Manet were famous painters but as well Absintheurs. They used to drink their glass in one of the bistros of Paris/France. Many of their artworks are inspired by the Green Fairy. Toulouse Lautrec also possessed his very own Absinthe spoon. It was beautifully ornamented and had an etching with his initials. H.L. Lautrec on the front. And he had a very special further gimmick. In his wooden walking stick a reservoir for two shots of Absinthe was included! Santé! Where can I buy Absinthe bottles online? A poster is a nice thing, but a bottle of absinthe is even better! Why, because you can drink some glasses and you will feel the inspiration yourself! You can buy original bottles of the green Fairy online in our web store. In case you need some advice which brand to choose, we recommend to check the absintheur reviews in the shop and our Absinthe bestseller list. Or follow our recommendation and go for the best Absinthe, we think it is Maison ALANDIA. Welcome to the World of Absinthe! Our Absinthe store was established in 2001, right after the re-legalization of Absinthe. From this date on we are proudly serving the Absinthe Community worldwide.